It was the first public appearance that many were expecting to happen, but Prince Harry flew solo on Saturday, November 12, when he showed up at an England rugby match without girlfriend Meghan Markle. Speculation about the pair appearing together for the first time reached fever pitch after Us Weekly confirmed that the Suits actress was in London earlier this week. But sources tell Us that the rugby outing was never going to happen — because Markle is already back in Toronto. "To be honest, they&apos;re relieved that they got to spend time together without being seen,” a close source tells Us. "It was a great trip. Going to the rugby together was never going to happen. It was an official engagement, not a social event, and Harry is a professional." Markle, 35, is understood to have landed back in Toronto on Thursday, November 10. Her departure meant it was business as usual for Harry — who is the Vice Patron of Rugby Football Union — when he arrived at Twickenham Stadium for a match between England and South Africa. Dressed in a smart black overcoat, Harry was joined in the stands by Zimbabwe-born Princess Charlene of Monaco and her brother Gareth Wittstock. Harry arrived at the venue with his private secretary Ed Lane Fox. 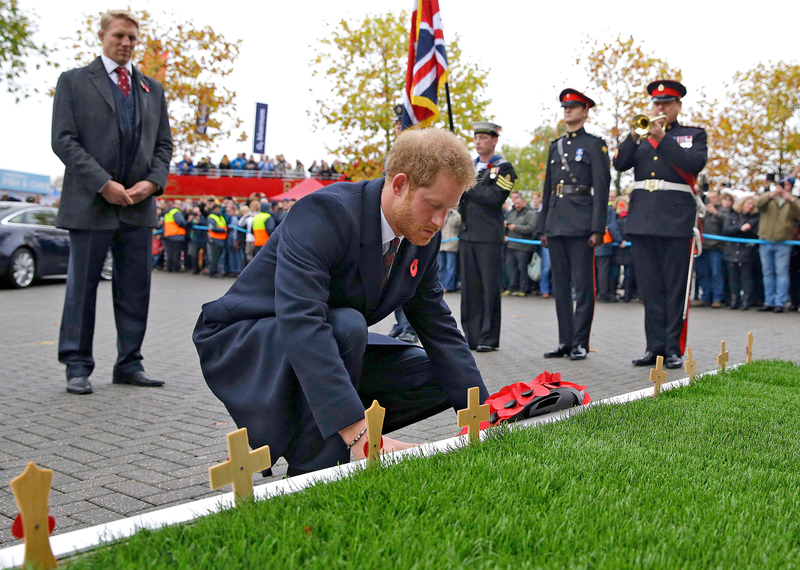 Before the game, Harry laid a poppy wreath ahead of Remembrance Sunday at the stadium&apos;s newly installed Rose and Poppy Gates, and then spoke with officials about a short film series that he contributed to. The Rose and Poppy films focus on how World War I impacted rugby communities and tells the stories of rugby heroes while highlighting links between rugby, rugby values and the military. It was also announced on Saturday that Harry’s Invictus Games — the Paralympic-style sports event for wounded, injured or sick armed forces veterans around the world — has picked Sydney as host city for the 2018 event. A video message released by Kensington Palace saw Harry make the announcement alongside Australian pop singer Kylie Minogue. "Hi, Kylie. Good timing. The 2018 Invictus Games is coming to Sydney; can I guarantee the Aussies are going to bring it?" the prince asked. Minogue teased, "You don&apos;t need to tell the Aussies to bring it — it&apos;s guaranteed." Next year the Invictus Games will be hosted in Markle’s current home city of Toronto. Says Harry, "We have raised the bar higher with each successive games, and I know that Toronto are planning an incredible event when they host the Games in September."